Although the English vintage drum market tends to be flooded with Premier, Olympic and Beverley drums, Carlton offered some really nice sets that often swoop under most people’s radar. Owned by John E Dallas, the Carlton brand dates back to the 30s with a foot firmly in the dance band era of drumming. 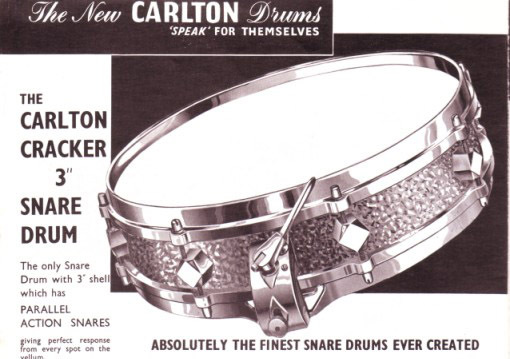 Carlton made some lovely sets right up until their disappearance from the drum world in the mid- late 1960s. 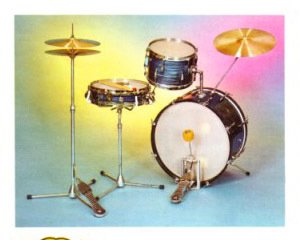 In the late 50s they introduced the ‘501’ outfit which featured 20x15 bass drum, 12x10 tom and 16x18 floor tom. Birch shells with reinforcement hoops, die cast hoops, internal tone control dampers (with a double damper on the bass drum). Single centrally fitted lugs on all the drums, with long tension rods on the floor toms. The bass drums had no spurs/legs fitted to the shell, still using the hoop mounted variety. The sets were offered in a variety of glitters and Pearls. These kits came with a 1003 snare drum as standard; a 14 x 5 wooden shell snare drum with modern streamlined die cast lugs, die cast hoops, internal tone control damper and a parallel snare mechanism. Other outfits around this time included the 502 (Bass drum single tom and snare drum) and the 504 (Bass drum and snare). Both these sets come up from time to time, and having had a few come through the shop I’m always taken with the lovely open sound these drums produce. I know of two studios in the UK who have a Carlton 501 set ‘in house’ using them regularly alongside other vintage kits for their different but charming sound. Studio Owz in West Wales put a video online of their Carlton 501 which they collected from me last year; fitted with Evans coated heads it produces a nice warm but controlled sound - https://www.youtube.com/watch?v=2xCGh6JzOzw. In comparison, Chris from The White Feather Collective has fitted his Carlton 501 kit with Remo Fiberskyns to give that big open vintage drum sound that really suits the sound of his band, which can be heard on this promotional video - https://www.youtube.com/watch?v=445ye3FZaLk.